When I was in need, they helped me. I am very grateful to the Salvation Army. When I was 18 years old, a country girl living out in the wild boonies of Upstate New York, I had big dreams after I graduated from high school. I went to live in Manhattan to go to an illustrious acting school. 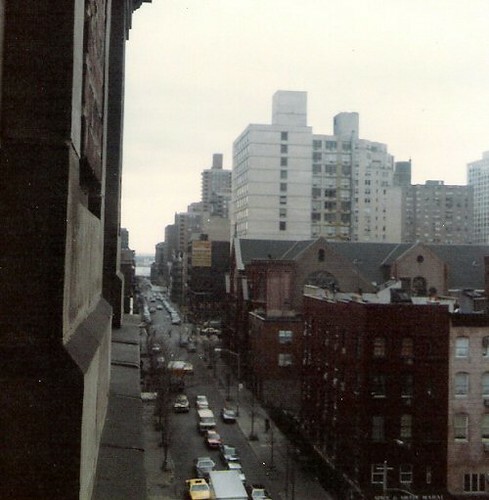 I had never been to the city, and I knew absolutely NO ONE, and the school has no dormitories; I would be on my own. But my high school friend’s mother took pity on me. She drove me to the city to show me around town, gave some tips about the city, put $20 in my hand, and directed me to a safe residence to spend the year. God bless that woman. The safe place was a women’s residence on Lexington Ave– the Salvation Army Home for Women (since been torn down). 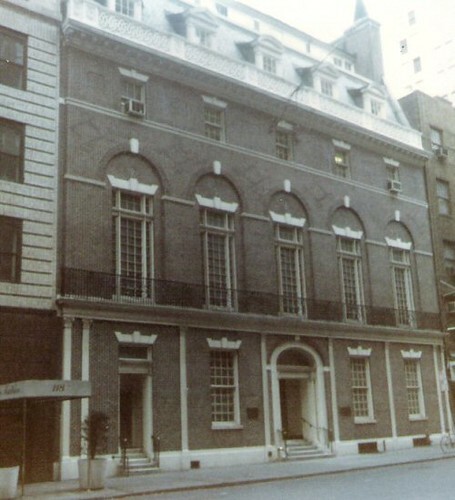 The American Academy of Dramatic Arts in Manhattan. Looking east outside my Lexington St apartment window. The Salvation Army residence held “vespers” which were church services, I guess. I only attended one. They also had “entertainment night” for the ladies, which usually involved one of the staff or ladies playing an instrument. A popular pastime for the older ladies was watching TV on a huge screen in the large sitting room. How those geriatrics endured sitting on those rickety metal chairs for hours baffled me. But I guess they’d do anything to watch Knight Rider and Dallas. Anyway, I comfortably lived in that place for a year, safe and sound. The residence had a security guard, and NO men were allowed beyond the lobby. I appreciate the generosity of the SA for helping me while I stayed in Manhattan. That year was not wasted, either, even though I never followed through with the thespian life– I eventually entered radio (and loved it!) and after becoming a mom, have become a professional blogger — delving into social media, communications, freelance writing and seo services. I have drawn from my early years, learning to speak well and communicate well, for the life career I have now. God is good. The SA has also helped us when we were in need, too. My husband has been through a lot of job changes, and seen some companies fold up their tents and move out of the state (we live in New York State). There were times when we had no food– the SA helped fill our pantry again. I will always be grateful for them for helping us out in time of need. They even got Christmas presents for the kids a few times. God bless them. As a young Christian, I donated my time as a bell ringer one season. Back then, we did it in pairs, and boy was it fun! It was so cold, but fun. People were pretty generous, too. Today, people are feeling the economic pinch, and I can’t say I blame them. But please consider giving something to those in need. The Salvation Army has a history of helping people around the world. It doesn’t take much, either. Maybe you can skip that bottle of wine for Christmas, or wear an old pair of shoes to the New Year’s party, or skip that seo subscription for a month or something. Even an amount as small as $10 is a lot to a hungry family. Believe me, I know. My friend Rena has created a virtual online kettle fund for her local area. I’m going to join it, too! Please consider donating to our little kettle. Even ONE DOLLAR is good. Your transactions are secure, through the Salvation Army site (we do not see any of your transaction at all). I hear they are low this year. Their biggest fundraising time of year is now, although they help people all year long. Reminds me that I need to make a donation. aaack!! The link isn’t working. Unless its my computer?